I was elated when I received a call from Laura Wrasman, the publisher of the Chicago Wedding Guide Magazine and Barb Montagano, director of sales, regarding placing an inspirational wedding reception design in the Party Scape section of the 24th annual celebration, of the best Chicago comprehensive wedding source magazine. 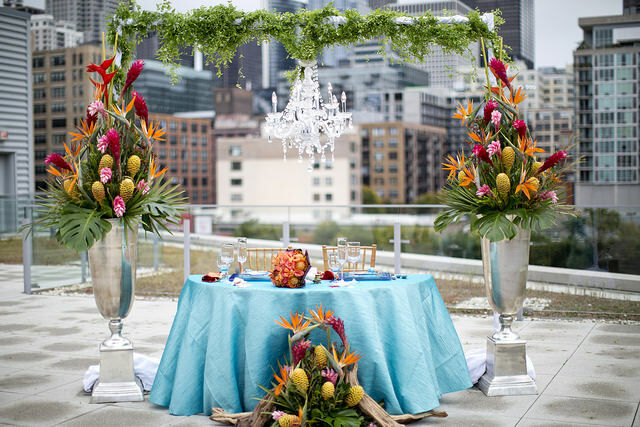 The Windermere Elegant Weddings Team inspiration for the Party Scape, in the Chicago Wedding Guide Magazine, came from the warm tropical elements of the Caribbean Islands with rich colorful flowers, beautiful clear seas, and warm romantic sunsets. Windermere Elegant Weddings feels that if a couple cannot host their DREAM wedding in their favourite destination, we can assist couples in creating a beach wedding like those on beaches in the Caribbean island of Turk & Caicos or Jamaica. We can even replicate the wine countries of California or the Smoky Mountains for your special day.